Forbes Celebrity 100 is an annual list worked out and published by Forbes magazine since 1999. The aim is to list the 100 most powerful celebrities of the year. Factors that are taken into account include income, Google hits, fan base, press clips and magazine covers. Jennifer Lopez, who is rumoured to have quit her role as a judge American Idol, has topped the 100-strong list which ranks stars based on a combination of earnings, press coverage and internet presence. Definitely, 2012 is totally the golden year for J Lo! She made not only the greatest career comeback of all time but also coped to grab the first place in the Forbes Celebrity 100 List! Jennifer Lopez Tops Forbes 100 Most Powerful Celebrities! So how did the 42-year-old hot mama manage to go from No.50 (!) in 2011 to beating out Oprah(second), Justin Bieber(third), Rihanna(fourth), and Lady Gaga(fifth)? 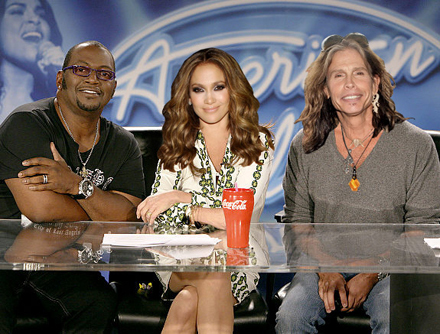 It all started with American Idol! Reaching the viewership of 25 million people each week is nice, but more importantly, the Fox singing competition helped to brand J.Lo from an unbearable diva to a sweet, careful mom audience can relate to. The show’s executives were so impressed with her performance, J.Lo’s reps negotiated a whopping $20 million for the second season of Idol. Not only did J.Lo use Idol’s huge platform to debut all her top hits, she also became the new face of L’Oreal, Gillette, Fiat, and TOUS jewelry. Yes, this woman definitely know what show business is! Moreover, J.Lo covered 46 magazines(!) last year, snagged People’s 2011 Most Beautiful title, and was named Glamour Woman of the Year. And her new movie What to Expect When You’re Expecting is in theaters now, and her new fragrance, Glowing, racked in $2 billion in total sales. Huh, I can’t imagine what heights her popularity will reach after her first international music tour with Enrique Iglesias, starting in Panama City in June! Good on you, J. Lo money-honey! As for other mots influential celebs. Oprah places second, just ahead of Bieber, who graces the cover. justin Bieber raked in a whopping $55 million, a figure that could go up next year with the release of his upcoming Believe album. 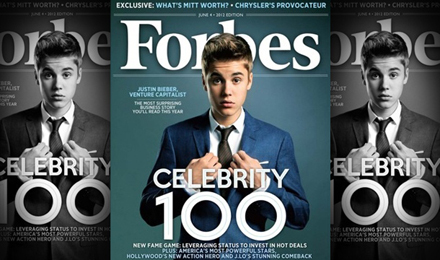 Forbes praises Bieber for his often-overlooked business dealings, noting that he has stakes in Spotify and Tinychat. Three of pop music’s biggest female artists hold down position from 4 to 6 are Rihanna, Lady Gaga, and Britney Spears, while Katy Perry comes in at No. 8. Other influential celebs include Taylor Swift (No. 11), Beyonce (No. 17), Adele (No. 24), Jay-Z (No. 38) and Kanye West (No. 45).